Spanish Cuisine, Bar, Music — Sofrita offers an eclectic mix of music featuring incredible Spanish guitarist and singers along with live Flamenco shows. Their unique venue offers an atmosphere that combines intimacy and energy. The crafted cocktail bar serves as an air of sophistication and sensual style. It’s the perfect place to lounge for sangria and tapas. The beauty of Puerto Rico is not just in the geography but in the state of being. It’s about generosity, the sharing of good spirit and good food. Sofrita is about the celebration of all things beautiful – the celebration of life. 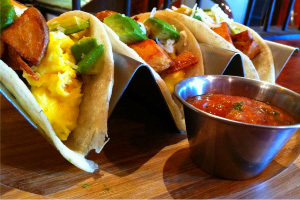 Sofrita is about having a full heart & a full stomach. A staple of Spanish cuisine is the bite-size treats: tapas. Sofrita’s irresistible Spanish-Latin flavors unite in a wide selection of bruschettas , mixed caribbean plates and other delightful selections of authentic flare. Sofrita is about the celebration of good cheer. A fabulous festive gathering of good friends, delicious food and flowing sangria. 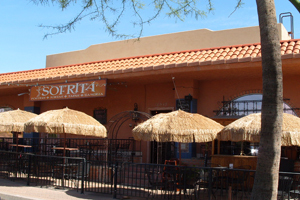 Sofrita is a unique gathering place intended to stimulate the senses of taste, sight, and sound. Food experiences shape our lives. From romantic dinners to passed-down family recipes to crazy eats in tiny alleys, meals contain some of our most vibrant and formative memories. At Sofrita our ambiance creates an absolutely beautiful way to preserve every dish and memory you create with us, with happy hour every day from 3pm to 6pm.